Top Gear’s anonymous racing driver, ‘The Stig,’ arrived at the BBC in a tank to deliver a petition demanding the broadcaster reinstate scandal-magnet Jeremy Clarkson. 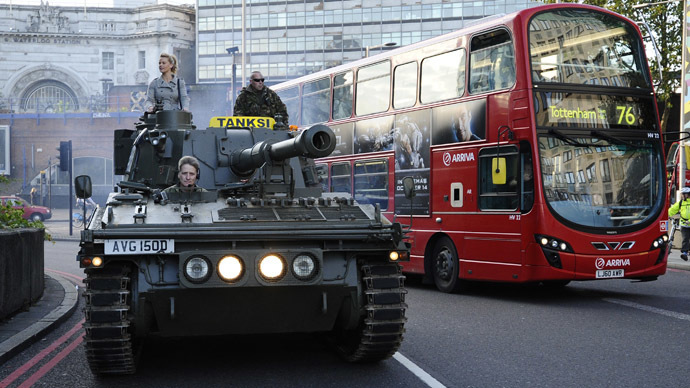 The driver, a helmeted character on the motoring TV show, could be seen holding a box containing “one million signatures” atop a 17 tonne Abbott tankoutside the BBC’s broadcasting house. Clarkson was suspended from Top Gear after an alleged ‘fracas’ in which he is reported to have punched a producer for not laying on hot food for the show’s crew during filming. The stunt was organized by political blogger Guido Fawkes. The petition was around 8,000 signatures shy of one million. The Metropolitan Police was forced to issue a public statement, for fear the sight of a tank rolling through London’s streets may startle motorists and pedestrians. The verdict on Clarkson’s permanent suspension from the channel is due next week. He is alleged to have punched Top Gear producer Oisin Tymon and called him “lazy, Irish c**t,” leaving him with a bloody lip and requiring medical treatment. The Change.org petition, however, has seen the television personality garner a huge amount of public support, and is believed to be one of the fastest growing online petitions ever. The petition calls for “freedom to fracas,” and demands the BBC give Clarkson his presenting position back. His co-presenters Richard Hammond and James May have reportedly refused to present the show without him. Brie Rogers Lowery, UK director of Change.org, told The Independent: “The pace at which this petition grew was interesting to watch, but it’s quite different to most of the petitions we see on the site.